The New York City Marathon takes place Sunday. At various points along the route, runners will hear everything from bagpipes, hip hop, rock and jazz fusion to a high school band playing the theme from "Rocky." The focus is naturally on the runners, but the dozens of musicians who show up are posted along the route to entertain onlookers and lift the runners' spirits. Ian Chillag will be among the 30,000 runners tomorrow. We asked him for his memories of past races. We also talked to some of the musicians who keep the runners going each year. Ian Chillag: Out at the start, there's just all these really nervous people milling about. Some of them are trying to rest. Some of them are lying down. There's the world's longest urinal, it's like a long trough. I'm going to guess, 50 yards long, with men standing and having no shame. And then, everyone's so well hydrated, they go out to the start - and there are no port-o-johns - and the smart guys, or at least the experienced guys who have done it before, have brought a bottle with them, which they tuck up their shorts. You can pee into that. Then you take the bottle out, you seal it up, and you hand it to the guy next to you and you say - you always say: "Not water!" It's this great community: Everybody passes the bottles of urine down, and the guy at the end tosses them over. They fire a cannon, and I think it's, "New York, New York," that they play. No matter where you are, you can't really run for the first half mile or so, because there's so many people and people are excited and people are cutting you off. You're crossing the Verrazano Bridge, and everybody likes to look over. The fire boats spray their water, and it's this beautiful thing. Around the eight mile mark, as the race moves out of Park Slope into Fort Green, there's this huge collection of people. You hear it coming, then you make this turn, and the crowds are just enormous. Then there's the Hasidic neighborhood in Brooklyn, where there are far fewer fans. There's not a lot of cheering there, but people are out and watching. Actually, the first time I ran, that was, I think the first really silent part of the course. Immediately out of that, you go into that hipster part of Brooklyn, and I remember that somebody had huge speakers out and they were playing that Daft Punk song, "One More Time." Louis Maffei: My name is Louis Maffei, I'm Director of the Arts at Bishop Loughlin Memorial High School. We plan on doing what we've been doing for the last 31 years, which is performing the theme to the "Rocky I" movie. This started as a joke by our track coach, Ed Bose, who was one of the founding members of the Roadrunners Club. 31 years later, we are the original marathon band. We're still performing, although on that day we performed "Rocky" with about 10 band members. On Sunday we'll be performing with anywhere from 130 to 160 band members, depending on how many alumni show up. Ian Chillag: The most feared part of the New York Course is the Queensboro Bridge, which is about mile 15. It's a hill to begin with, and there are no spectators allowed on the bridge. So, you've had this music the whole time, and then it's gone. It's like, "Oh crap! I'm trying to run 26 miles. This was a horrible idea. Why am I doing this?" All you hear is the shuffling of feet around you, and it's this very serious, very dark moment. Will Duggan: Hi this is Will from the band Squirrels from Hell. We've been performing for 30 years, and 20 years of that at the New York City Marathon at our regular spot on 1st Ave and 113th Street. That is the 19th mile. Fists are in the air, as they're running by. It gives them the extra push to get the last six miles in. They come out every year for us - the neighborhood there in Spanish Harlem. They love it. The runners - we have a harmonica player from Key Biscayne, Florida, Louie. He stops off and plays a little blues jam with us. Every year we look forward to him. He has his own crowd that shows up waiting for him to come. Our former guitarist from California flies in. 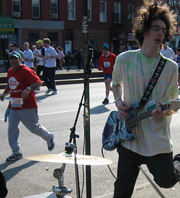 He runs the marathon, and we have a little guitar and amplifier for him. He stops in, plays a few songs with us, and continues back in the race. They look forward to what type of music the next mile has in store for them. We'll never be able to run it, but we can play it. Ian Chillag: If you make it to mile 21, you're going to finish the thing. I love watching after I finish. People just look horrible, and that's amazing to see. But, it's also great to see just how shocked people are that they were able to do this, and just how happy people are. Running is pretty boring. The only thing that changes is that it hurts a little more as time passes. So, to have something to break that up - even if it's the anticipation of music that you can hear in the distance, and getting to the music, and then the music being gone and then waiting for the next thing - anything to change what's going on is good when what you're doing is running. I have been searching high and low for this -- and FINALLY found it. I've shared it with my running group and running buddies...it is very inspirational to us.